Each year, the Prince Michael International Road Safety Award recognizes the most outstanding achievements and innovations to improve road safety and save lives worldwide. On December 12, 2017, WRI Ross Center for Sustainable Cities was named a winner of the Prince Michael Award for its inspired and significant work to reduce traffic fatalities in low and middle-income cities through sustainable transport and urban design. More than 1.25 million people are killed around the world each year in traffic accidents – more than 3,400 a day – and projections show that there will be nearly 2 million traffic fatalities annually by 2020. To help prevent and reduce this tragic toll on lives and livelihoods, WRI Ross Center is working to change the paradigm by designing cities for people, not cars. 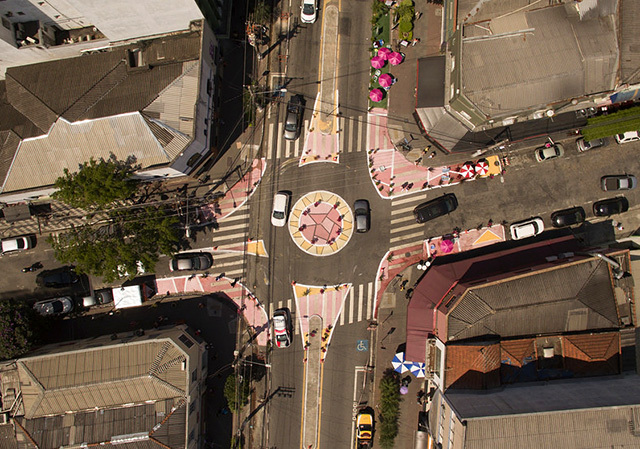 Road safety has long been perceived as the sole responsibility of users – drivers and pedestrians – but the Ross Center’s evidenced-based research shows that shifting the focus to mobility systems rather than users has a far greater impact on saving lives. WRI Ross Center works with policymakers and urban planners at the local and national levels to transform cities and transport systems. The Health and Road Safety program’s approach has three central tenets: to help cities avoid increased motorized travel, prioritize safer modes of travel such as public and non-motorized transport, and improve existing mobility systems and infrastructure to maximize safety. WRI Ross Center experts also provide technical support to influence design and investments in new infrastructure through road safety audits, inspections of projects and technical guidance on implementation. WRI Ross Center’s road safety work is made possible by the Bloomberg Initiative for Global Road Safety, with additional funding from FIA Foundation, FedEx Foundation, and Stephen M. Ross Foundation. Since 1987, the Prince Michael Road Safety Awards have given public recognition to those who have improved road safety throughout Britain. Now the Prince Michael International Road Safety Awards recognize outstanding achievement and innovation worldwide. The awards are organized and managed by RoadSafe.